Multi-panels post sign with changeable letters on the bottom panel. It holds 3' x 8' top panel and 1' x 8' bottom panel. Oriental Wok pylon signs located in Hyde Park, Ohio. 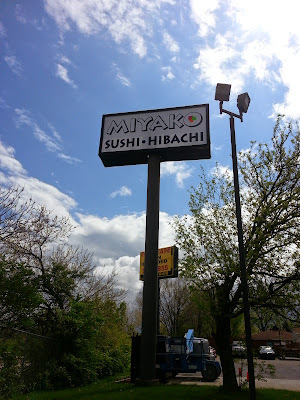 Miyako pole sign flex banner installation in Northern Kentucky. Showing the picture after one side is installed. Notice the natural light showing through the face as the opposite side hasn't been installed yet. High rise pole sign for the Scrambler Marie's in Sharonville, Ohio by I-275 exit. Pylon sign illuminated at night. Good example of how each design & letter types differs in visibility. Liberty Urgent Care pylon sign in West Chester, Ohio. Liberty Urgent Care on Pylon sign by the main entrance in Liberty Twp, Ohio. Another Liberty Urgent Care pylon sign close to the highway in Liberty Twp, Ohio. For temporary usage, banners are economical way to utilize for sale or lease. Parking Sign proof that was sent to a client for approval to be mounted on the U-channel post.